Finisterre to the left. Muxia to the right. Forest fire in the last few years? No bus, therefore a walk through Concurbion onward. Walking along beach into Finisterre. Left albergue and walked to town of Hospital, last cafe before 12 km stretch of wilderness. Felt there that I couldn’t go on due to being sick and considered calling a taxi. Dragged self up hill out of Hospital and somehow managed to keep going to Cee. Catia and Jacueline caught up and had long conversation. Views of Cee and Concurbion spectacular as walked down into towns. Walk here began to make me feel I’d made the right choice, though at Cee I began to think about taking the bus to Finisterre. Learned that since it was Sunday the last bus had already passed. Kept walking to Finisterre and finally came to Langosteire Beach, overlooking the town, still about 2 km away. Had cervesa with Catia and Jacqueline, Luke and Gal, then walked in water to Finisterre. Very sensual and beautiful with warm sun on my head. Arrived at albergue and decided to stay there. Received Fisterrana certificate and threw stuff onto my bed then set out to find Rocky. Finally found Rocky at beachfront bar with Monique. Had long conversation and learned Sebastian would join us for drinks at Faro Lighthouse. Sebastian arrived at 21:00 and we had dinner then took a taxi to lighthouse. Watched sunset with Catia, Rocky, Monique, Sebastian. Seb and I shared last drops of Cilantro. Tears as I write this. Ultimately our group joined by another 8-10 more and much revelry and laughter. At 23:30 time to get Seb back to his cab, so took cab back to Finisterre and had long, good bye conversation with him at waterfront, ending in long hug. After Seb’s good bye shared long goodbye conversation with Monique in which she told me I had done a good job of being a priest on the camino. Bed in albergue. Next day: Long breakfast at street cafe including final good byes to Catia, Jacqueline, Monique and many others. Taxi return to Santiago, then dinner with Rocky, Luke, Gal, and Brooks and Jamie of Birmingham, AL. A beautiful and blessed camino 2011. 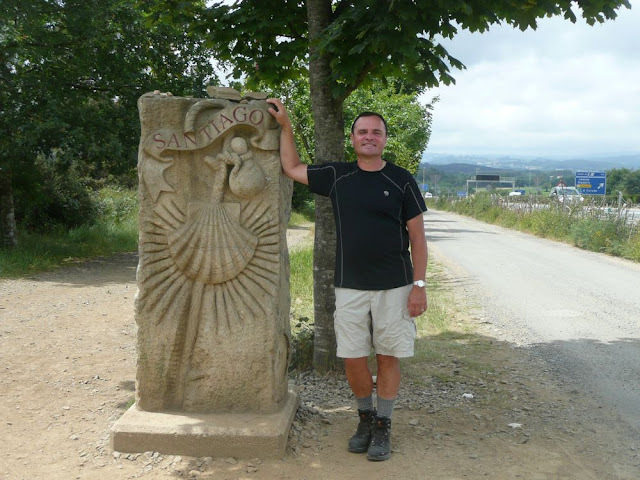 Long 32 km walk to small town of Olveiroa (Galego spelling). Learned that Catia and Jacqueline were just behind us, so hoped to see them today. Had long talk with Luke about “home” and vision. Progressively sicker with fever and head cold throughout the day. By evening I was interested only in dinner and curling up in bed. Albergue is unique — 3 buildings spread across street from each other in this exceedingly small town. Besides the two cafe/bars and the albergue there doesn’t seem to be much in this town. So it’s rather quiet and pretty delightful. No light in the bathroom, so had to shower in the dark. Tossed and turned through the night and probably kept some awake with my restlessness. Luke with camino friend Gal. 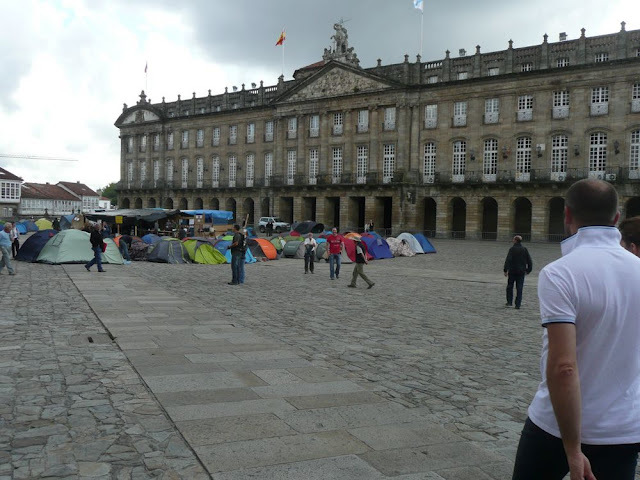 Met Luke and Gal at 09:00 at Plaza Obradoiro and Luke’s experience of walking to Finisterre/Muxia in 2009 was helpful in getting out of town. Arrows actually became plentiful after a bit and before long we were on a hill opposite the cathedral with a great view. Continued up large hill and across ancient bridge over beautiful river. Much rain and wind into Negreira. Happy to find town, but albergue was on opposite side of town and separated from all shops and restaurants by almost 1 km. Got beds at albergue and walked back to town for lunch at local restaurant. Then grocery shopping and return to albergue for showers and laundry followed later by cooking by Gal. Vegetarian dinner by Gal was huge and delicious. Best dish was friend cauliflower. Shared dinner with Matthieu and enjoyed wine and conversation. Shower and bed in room with 10-12 single beds. Quiet night. Roberto of Mexico — with wife and sister, staying at my hotel! Then nap at hotel room. Agreed that our pilgrim family would get together at 20:00 for dinner. Arranged to eat at same restaurant as last night with Luke and Gal. Met our family plus 2 Germans — Eike and Simone — at restaurant. Andreas performed German Nazi/Swedish/Finn sketch to great effect. Poor food, but shots of house specialty afterward set everything right. Went out to street to hear Luke then Andreas play guitar and sing. It was awkward to sit in the middle of this pedestrian road, but no one wanted to say good. Finally said our goodbyes for last time, then off to bed to rest for tomorrow’s walk to Finisterre. Awoke at 06:30 and began to pack at 07:00. Andreas insisted on cooking eggs for us — what a sweetie. Done with eggs and conversation at 07:30. Got mini pack from Annina. Hannes of Germany asked “What do you carry in that, your cosmetics?” Big laughs. Left my pack at the albergue door for the pack service and left with jacqueline for long walk (40+ km) to Santiago at 07:45. Leapfrogged most of day with Addison and Alexa, and also with Pieter of Austria, whom I found to be pleasant and humble. Saw Roberto of Mexico! Could not believe my eyes. He had sent his cousin home as she could not handle the exertion. Lunch at O Pedrouzo, then long slog through farms and the endless Santiago airport until finally reached Monte de Gozo. Had heard from Stefan of South Africa that he was leaving at 18:30 so rushed to get to Santiago by 18:00. Had also heard from Luke that her was ill with sinus infection and diarrhea, so advised him to go to Farmacia/clinic on arrival by bus in Santiago. Arrived at 18:00 in Santiago and talked and walked with Stefan. Heard Stefan’s good and important ideas about religious faith and encourage him to write his book. Realized that Stefan thinks I am a conservative Christian — I should send him a book by Marcus Borg about new views of Christianity and I think he will be surprised and interested in a different perspective on Christian faith. As dropped off backpack with Stefan at my hotel saw Christina and Meg (Meg Rayne). They were happy and playful and I would have loved to visit more with them. Truly two very beautiful people. Also saw Jacqueline who was behind by only 20 minutes or so. Said a very sad “good bye” to Stefan, my dear pilgrim friend from 2008 as he got in his taxi to the airport. He is a dear person and much fun and inspiration to be with. Arranged dinner with Luke and Gal. At dinner heard Luke’s many stories and really enjoyed together time with the two of them. Off to Hotel Altair for quiet night’s rest. Alexa and Addison of Seattle, surprise Americans discovered in Arzua. Agreed last night with pilgrim family to meet them at 11:00 in Melide. Relaxed at hotel, recharged phone with money, went to cash machine. Arrived at restaurant and waited only 10-15 minutes. Group arrived, many pictures, much conversation. Catia only one to order pulpo. Left restaurant and began short walk to Arzua. Long talks with Catia and Sebastian. Said goodbye to Catia at Ribadiso. She will wait there for Bea and they will walk together into Santiago. Sad to say goodbye as may not see her again. Walked into Arzua and found albergue after albergue “completo.” Finally found “Albergue Via Lactea” with room for all of us and kitchen. There met Addison and Alexa of Seattle — a very big surprise to find Seattleites here on the camino. They work at Nilson’s Bakery on Lower Queen Anne Hill, perhaps 1/4 mile from my office. 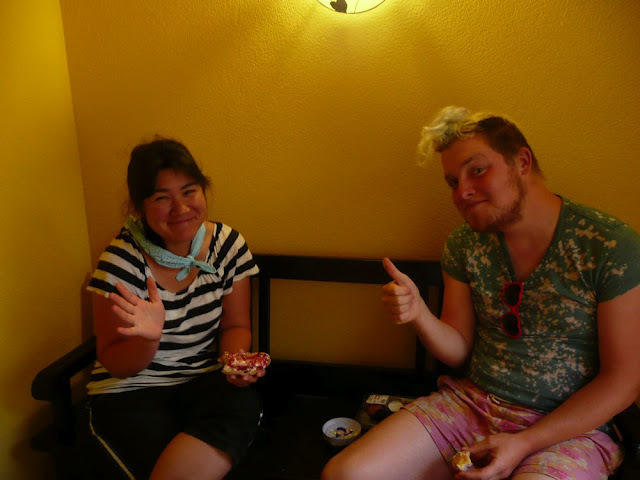 Andreas and Annina cooked rice/veg dinner and we ate together in front room of albergue with wine, laughter and storytelling. 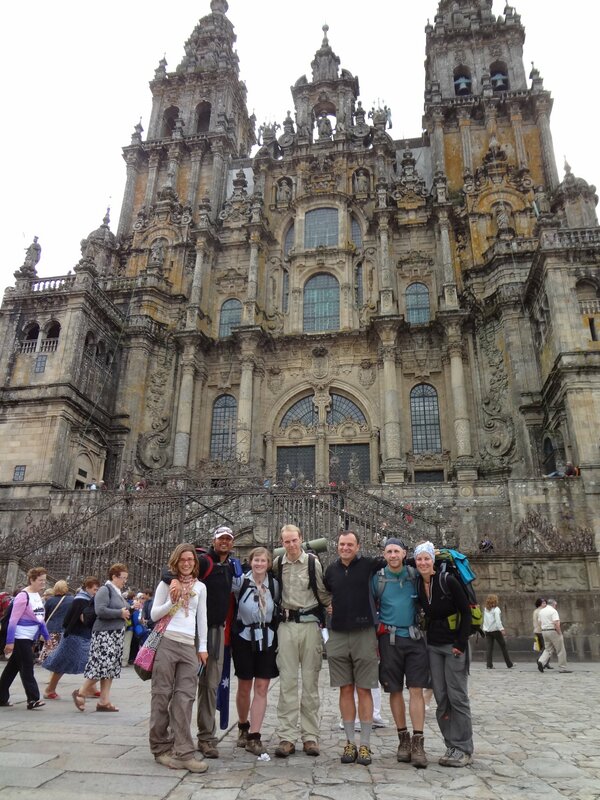 Jacqueline and I both decided to walk full distance to Santiago next day and I arranged to have my pack sent ahead. This will allow us a rest day in Santiago and I can stay in my favorite hotel an extra night. Pilgrim family at restaurant in Palas de Rei. 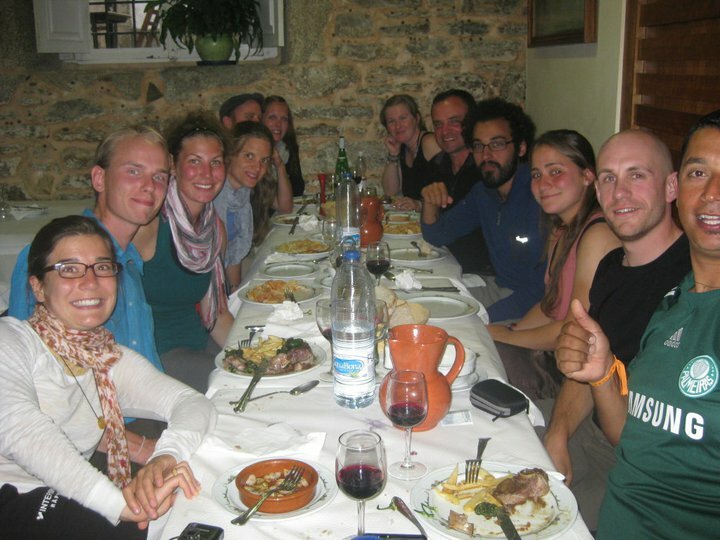 Clockwise from left: Sebastian, Annina, Alexandre, Catia, Jacqueline, Nikki, Andreas. Left late after talking with Sebastian on Jacqueline’s phone at panaderia across from albergue. They are to be in Palas de Rei tonight, so texted them later that I would taxi back with Jacqueline and meet them for dinner there. Walked quickly to Melide for lunch there with Stefan of South Africa and his friend. At pulperia in Melide Stefan shared full spiritual concepts he had been developing since reading Eckhardt Tolle. He has some extremely good ideas. I suggested he read Thomas Merton, Thich Nhat Hanh and Anthony de Mello. I hope he will write his story in order to publicize these great ideas. After lunch got a room at same hotel where Gail and I had stayed in 2008, just across from the albergue. Looking this afternoon for peluqueria for haircut after shower. Then taxi to Palas de Rei. Nice hotel room – Chiquitin is the hotel. As opened door to taxi in Palas de Rei all pilgrim family was there to cheer and hug. Dinner at same restaurant as last night. Many stories, much joking and round of arujo on me. At dinner was whole gang, less Bea. Beautiful pilgrim family moment. After dinner asked restaurant to call taxi for return trip to Melide, but no taxi available. Waiter drove us back instead. Paid him 20€ for his kindness and gave many thanks. Though he and the restaurant staff had been a little gruff with our pilgrim family, he turned out to be very gracious in getting us back to Melide.